Step 1 In a bowl, whisk together one-fourth cup olive oil with minced garlic, crushed red pepper and the juice of one-half lemon. Lightly salt both sides of each sardine, and then brush both sides with the olive oil mixture. Set aside. Step 2 Empty both cans of beans into a strainer and rinse under running water until the water runs clear. Set aside to drain thoroughly. Step 3Cut each of the tomatoes in half and place in a large work bowl. Trim the ends of the cucumbers, cut in lengthwise quarters and then in one-half-inch pieces, and add these to the tomatoes. Add the red onion, the drained white beans and one-fourth cup olive oil and stir gently to mix well. Season to taste with salt and black pepper. Step 4To make the pesto, drop the garlic cloves through the feed tube of a running food processor or blender and mince until fine. Turn the machine off and add the basil leaves. With the machine running, slowly pour two-thirds cup olive oil through the food tube to make a smooth flowing sauce. Season to taste with salt. Step 5Heat a grill or a stove-top grill pan over medium heat until hot. Shake any excess olive oil mixture from the fish before grilling. Brush the grill pan with olive oil and place the sardines on the grill skin-side down and cook on one side only until the color has changed all the way through, 5 to 7 minutes. Reduce the heat as needed if the fish begins to darken too quickly before it cooks through, and cover the pan with a lid to concentrate the heat if the fish cooks too slowly. Step 6When the sardines are done, squeeze over the remaining half lemon on the flesh side. Step 7Divide the white bean salad evenly among four to six plates. Arrange the sardines on top, skin-side up. Spoon pesto in a ribbon over the sardines and salad and serve immediately. In Recipes-list.com we have selected the most viewed recipes from category - Fish and shellfish Grilled Main courses . Enjoy the best recipes specially selected for you! 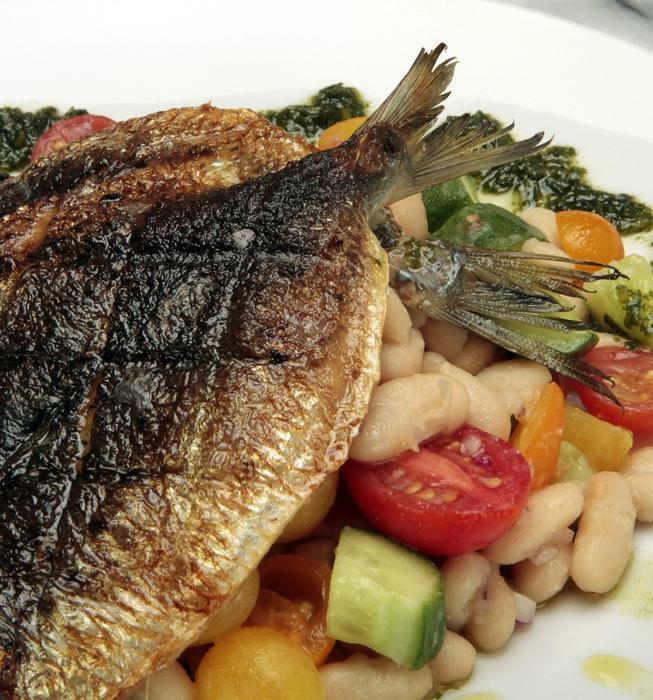 Grilled sardines with white bean salad and pesto is the right choice that will satisfy all your claims.